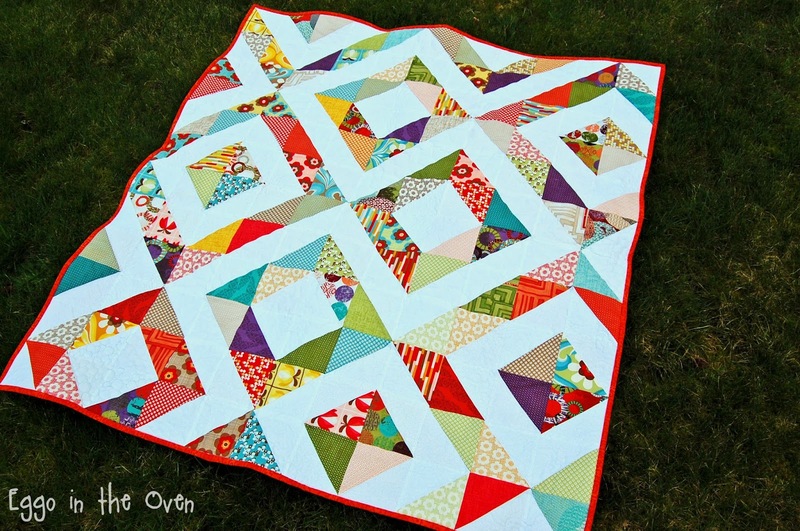 I am excited to share my quilt for the final Project Quilting Season 5 Challenge - inspired by triangles. The challenge posted on Sunday..... but I didn't get to start working on this until Wednesday (briefly) - and most work was done Thursday evening and Saturday. Well, and Sunday seeing as I finished this quilt at 2:15am this morning! 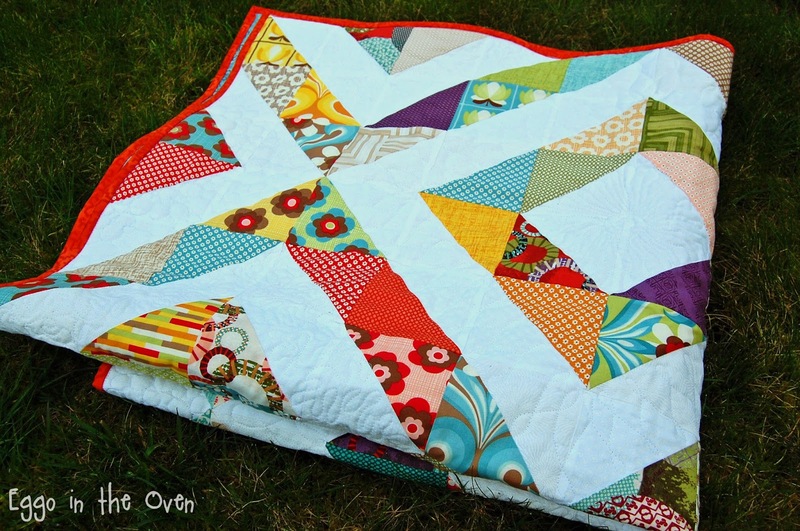 The name I'm giving this quilt is very appropriate - as it is something I kept saying all week / weekend - WWIT - what was I thinking?! This quilt is 44" x 48". It is comprised of 132 half-square triangles that finish at 4". I combined two Moda charm packs (Urban Chik and Juggling Summer) that I thought worked well together (after removing a few colorways of one of the packs) - along with a sampling of white-on-white fabrics for the negative space. I free motion quilted the white spaces using a variety of patterns - really just whatever came to mind. I love how it helps make the colors POP even more. The backing is a Blank Fabrics dusty aqua (is that a color? I'm going with it! It's a bit more green than the photos are showing) floral picked up at a local fabric shop. It is bound in a rusty orange print from Jo-Ann fabrics. I kept thinking "I should scale back.... I can finish this sometime soon, but can I really get it done by Sunday?!" 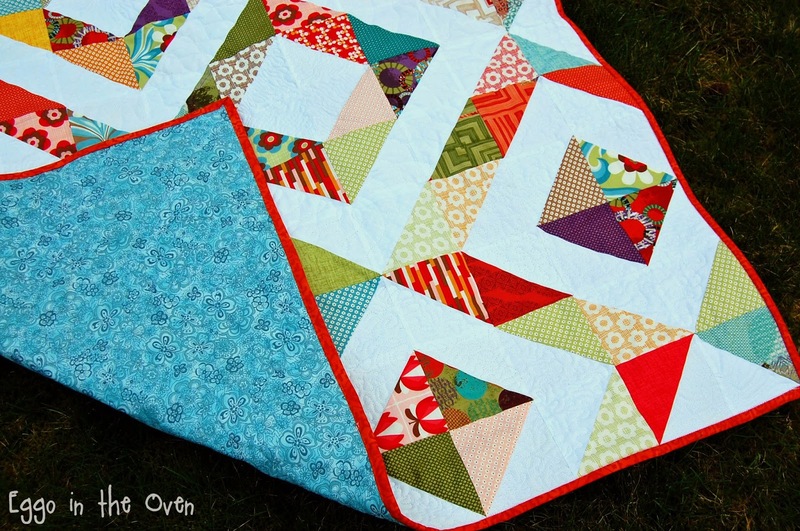 I thought about straight line quilting it to save time.... but I just kept thinking "I have put all this work in already, and I KNOW I want to do something softer and rounder to contrast with all the sharp angles." Turns out.... with some LATE night (or early morning?!) sewing - it can get done! I create in my home studio in Montesano, WA during nap time, after kiddos go to bed, or with two adorable boys "helping" me. To vote, just click on the heart in the corner of the picture. Clicking on the pictures will take you to the blog or flickr post to read more about the project! Wow!!!! 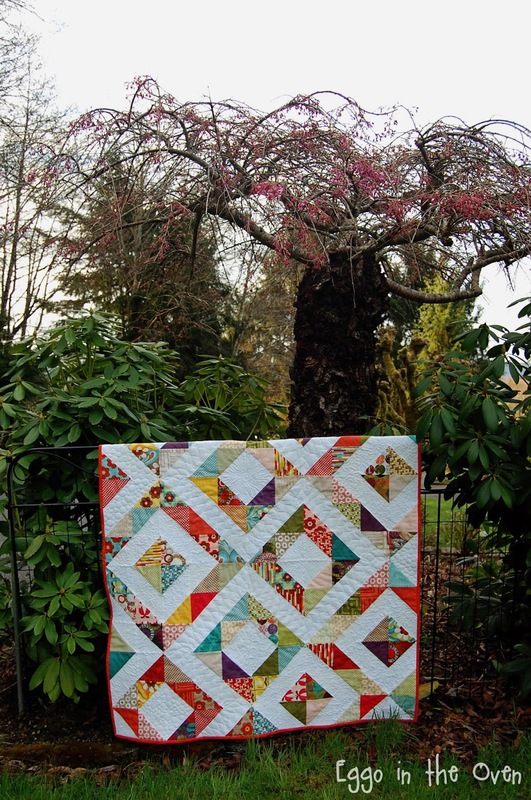 Beautiful quilt, so colorful and graphic! Great job persevering and getting such a big project done....go out with a bang for the PQ season, huh? 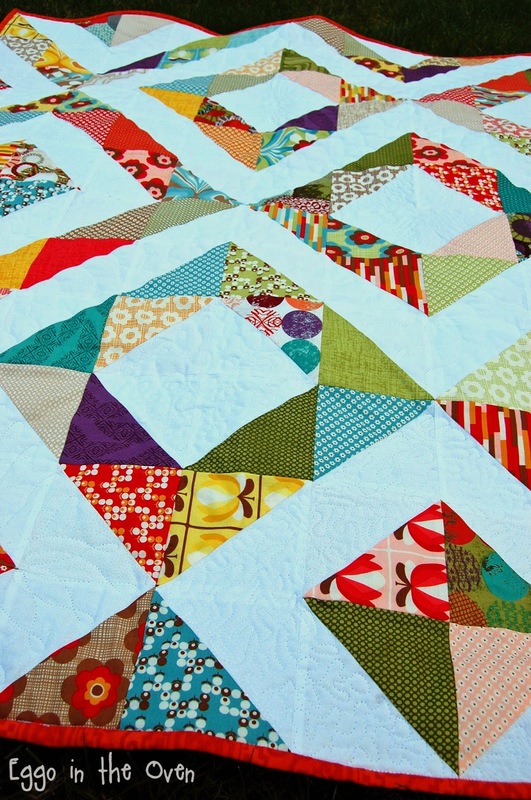 Gorgeous quilt, worth staying up half the night for. The bright colors really make it sing. It's so bright and happy! I loved seeing all your possible layout ideas, and any of them would have been great. Now, take a nap! Thank you! A nap would be nice..... we'll see - - - but we will DEFINITELY be going to bed early tonight! This looks fantastic! Way to go for it even with limited time! I love the bright binding. Good to know somebody else was burning the midnight oil to finish in time. And yes.... the very late midnight oil over here! 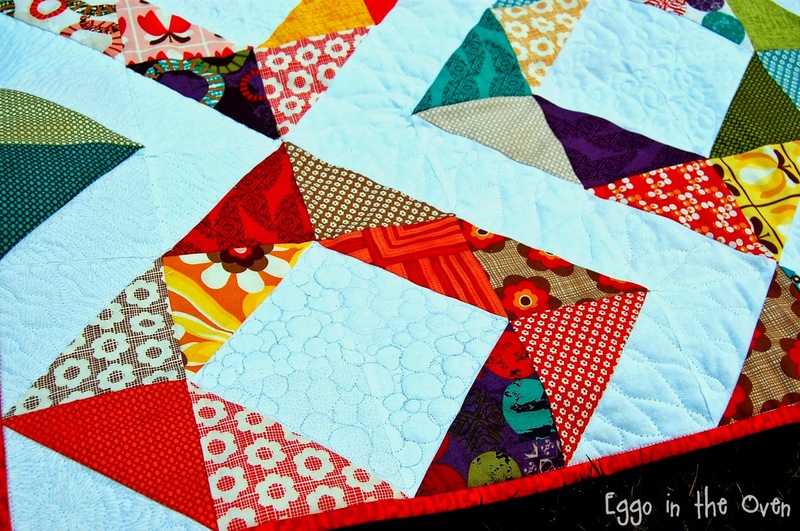 I am always impressed by quilts and how quickly people sew them! I love the colors and the design. Great job! WOW this is stunning! Clicking over to vote for you now. 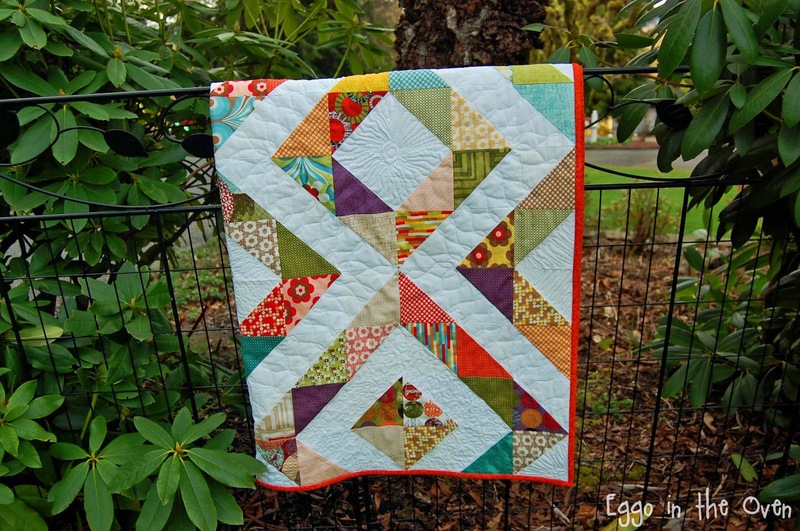 Impressive quilt in such a short time! 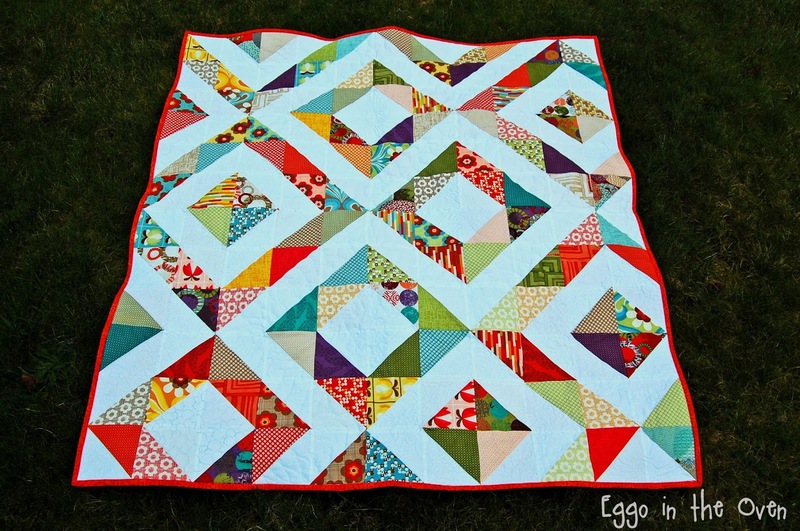 I love the layout, and your colors are so bright and happy! Thank you Meriel! The layout was something I just stumbled upon as I was turning the HST blocks - so fun! Love the pops of red/orange that are brought out by that deep orange binding. And don't you just love HST play? Though it does help if you have more than a week to finish the whole dang thing.